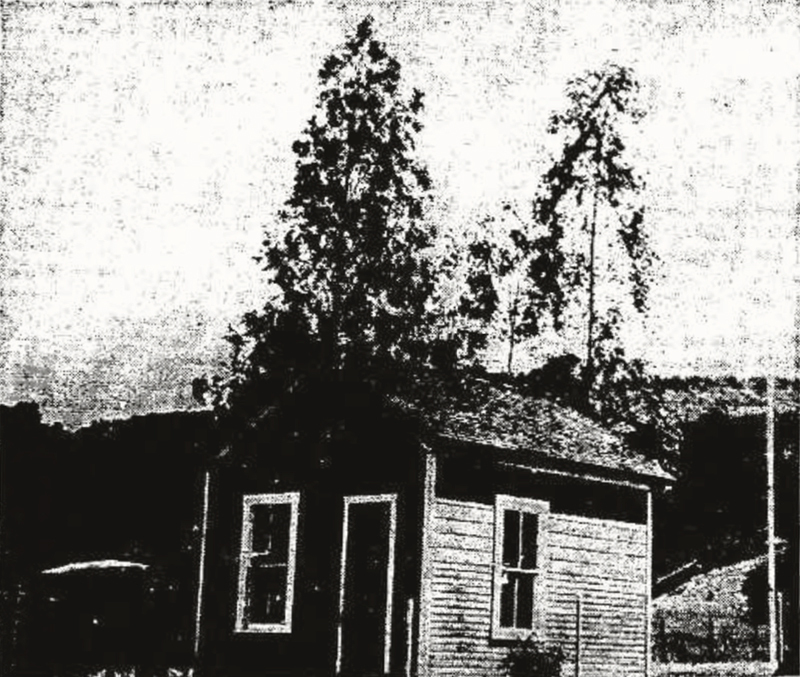 USDA Forest Service Newhall Ranger Station, 1923 (the year it opened). Located at 23610 San Fernando Road, later called Newhall Avenue. Apparently in 1975 (further research needed), by which time the original building was long gone, the federal government transfered the property to Caltrans, and in 2010 the City of Santa Clarita purchased it from Caltrans for the appraised value of $1.096 million with the intention of developing it into an affordable housing complex. The redevelopment deal didn't materialize; the city was left with the property and turned it into the Oak Creek Park & Ride. Prevailing state law restricted the sale of Caltrans property to affordable housing or transportation uses only. As of 2014, there are no structures on the property and the street address no longer exists (it's a vacant park-and-ride lot). UPDATE: Affordable housing project opened on the site Oct. 18, 2017. This image was published with the news story that appears here. (Original caption merely repeats information in the story.) Click image to enlarge. The Angeles National Forest is celebrating this month and next, in observance of 75 years of land management and protection of the San Gabriel Mountains, according to William T. Dresser, forest supervisor. Only one large celebration is planned for the 75th year, Dresser said. This will be a combined celebration tomorrow with the Fenner Canyon Job Corps Conservation Center, 25 miles southeast of Palmdale. A 10 a.m. ceremony will take place at the center commemorating the second anniversary of the center and the National Forest's 75th. The center is administered by the Angeles Forest. The Angeles Forest was established on Dec. 20, 1892, as the San Gabriel Timberland Reserve, Dresser said. In 1907 the name was changed to San Gabriel National Forest and in 1908, to the present name of Angeles National Forest. Supervisor Dresser said the early establishment of the Angeles Forest makes it the first such area set aside in California. Still standing today is the first U.S. Forest Ranger Station in the United States, constructed with government funds ($70). It is located in the West Fork of the San Gabriel Canyon, six miles by dirt road from Angeles Crest Highway at Red Box. According to historical records, it was at the urging of the local people and water companies from Los Angeles, foothill cities and Antelope Valley that the Proclamation signed by President Benjamin Harrison in 1892 was brought about. Early records show that Thomas H. Carter, a U.S. commissioner in 1892, wrote: "The future prosperity of Southern California depends upon protecting the water supply of the numerous streams which have their source in the mountains embraced in the Reservation..."
From the early-day San Gabriel Rangers, the Angeles National Forest has grown under intensified land management and protection to meet the needs of an increasing population to a total of about 500 Forest Service employees, Dresser mentioned. 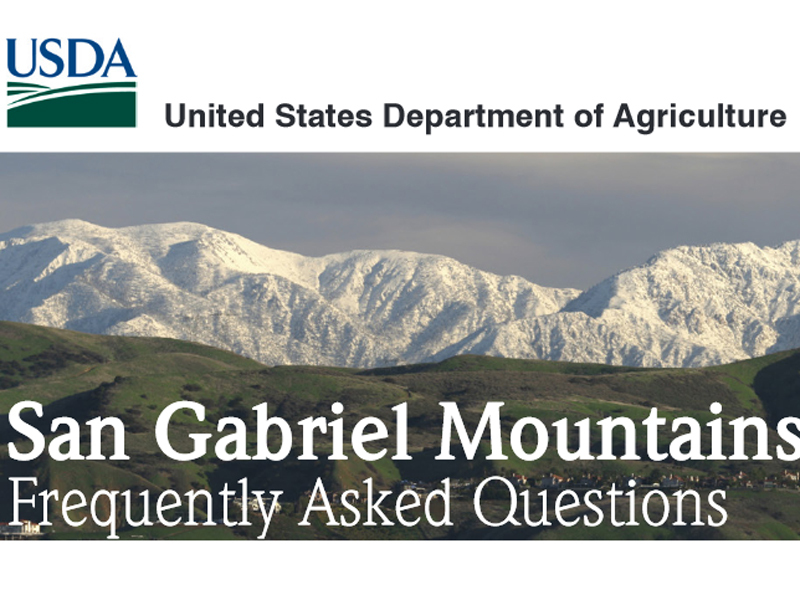 Under the administration of the Forest Service, U.S. Department of Agriculture, the local National Forest covers some 691,000 acres of public land in the San Gabriel Mountains. The southern boundary lies above the foothill cities from San Fernando to Upland, the eastern boundary lies about the 10,000-foot Mt. Baldy, the northern line runs along the edge of the Mojave Desert and Antelope Valley and the western edge is along Piru Creek and Highway 99, north of Newhall. Today, U.S. Forest Rangers manage the San Gabriel Mountains for watershed protection in water conservation, flood prevention, fire prevention and control. An important use of the National Forest is outdoor recreation for many millions of Los Angeles County and Southern California residents. More than 5,500,000 people visit the Angeles Forest each year for all forms of outdoor recreation. The Angeles Forest today is one of 17 National Forests in California administered by the U.S. Forest Service. U.S. District Forest Rangers plan historical photograph exhibits during November and December. District Stations are located at Oak Grove Park, Pasadena; Glendora, San Fernando, Newhall and Pearblossom. The Forest Service headquarters office at 1015 N. Lake Ave., Pasadena, will have a display of early day photos.